A minister and occupier, beaten and arrested by police, on his continuing belief in the power of love. 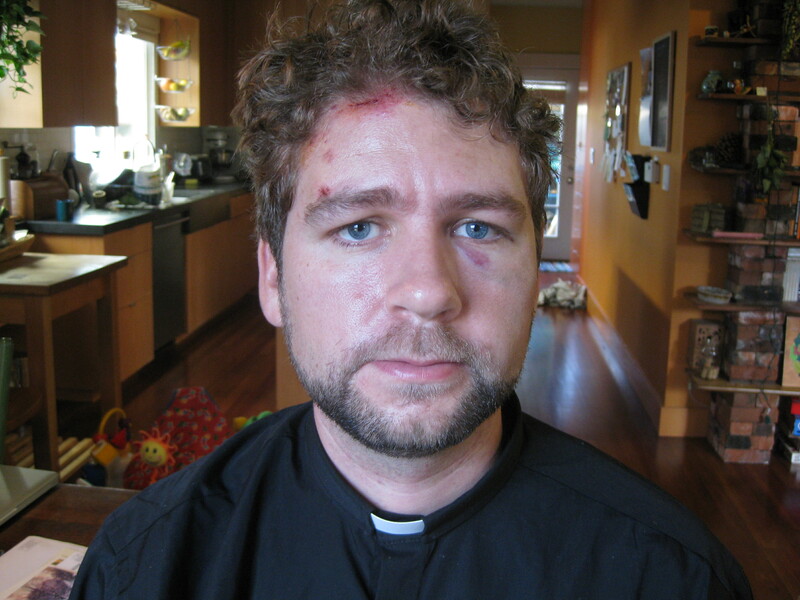 Reverend John Helmiere after his encounter with the police at the Occupy protest at the Port of Seattle. An officer pulled me down from behind and threw me to the asphalt. Between my cries of pain and shouts of “I’m a man of peace!” he pressed a knee to my spine and immobilized my arms behind my back, crushing me against the ground. With the right side of my face pressed to the street, he repeatedly punched the left side. I was cuffed and pulled off the ground by a different officer who seemed genuinely appalled when he saw my bleeding face and my clerical collar. He asked who I was and why I was here, to which I replied, “I’m a minister of the gospel of Jesus Christ. I believe another world is possible.” He led me shaking to a police van where began a 12-hour journey of incarcerated misery. The afternoon of Monday December 12 began with a march from downtown Seattle to the Port in a coordinated attempt by west coast Occupy movements to expose exploitation of workers and interrupt business as usual at major Pacific ports. Upon arrival, the crowd spread out to picket or blockade entrances. I joined a small group of about 40 to picket a side entrance (we did not stop anyone from walking in or out). Several hours later, word came that business had been canceled for the day and our group dispersed in high spirits. My wife, Freddie, and I considered going home after a long, chilly day of standing up for what we believed in, but decided to check other parts of the protest to see if there were important needs we might fill before departing. As we neared a major entrance, Pier 18, the tension was almost palpable. Hundreds of people had been occupying the blockaded road for hours while police kept their distance. But night was falling, mounted officers arrived on the scene, and the police began to maneuver into position. I began to feel a great fear ballooning in my chest and seriously considered leaving. I worried that the police would be ruthless under the cover of darkness. My Christian convictions call me to nonviolence, but I had only practiced this by intervening in street fights—never in the face of a militarized force that believes they can act with legal and social impunity. But in my spiritual core, the place where conscience prevails over fear and self-interest, I knew that I could not run away when the situation desperately called for disciplined nonviolent voices. e ground and punched me numerous times. With hands cuffed behind my back, I was led into a police van and caged alone for a half hour. In the dim light and cramped space, I sang “This Little Light of Mine” and recited Psalm 23 to stave off a gnawing fear. Eventually, a few more occupiers joined me and we were transported to a holding facility where they split us into pairs and left us in tiny concrete rooms for several hours. The rooms were voids in every way: windowless, empty (no facilities, no benches), lit with glaring fluorescent bulbs, gray and white. My void-mate was a terrified kid who gave me heart by singing protest songs while I shared some meditation techniques for maintaining self-possession in trying moments. Eventually we were hauled off to the county jail and had our handcuffs removed after four long hours of immobility. My conception of God ... contrasts with everything that reserves power, dignity, wealth, or the status of full humanity for some while denying these things to others. As I walked through the metal detector at the jail, a fellow occupier I hadn’t spoken with yet looked at me in my collar and said, “You’ve just been baptized.” They outfitted us in thin cotton jail uniforms, and proceeded to move us from cell to freezing cold cell for the next eight hours without any clear purpose or explanation. During that time, the adrenaline wore off and my bruises and lacerations began aching intensely. I asked officers and staff at least six times to see a nurse and was consistently denied that, as well as water and food. Finally, during the final hour a nurse took pity on me and found an ice pack for my face. At 5:00am we were released to the street after obligating ourselves to appear before a judge at a future date. Why was I there in the first place? Protesters from Anchorage to Los Angeles coordinated a controversial mass effort to shut down the West Coast's ports. First, I participated in the port occupation at the behest of some of the most exploited and underpaid laborers in our city—the men and women who truck containers in and out of the port. Over the past nine months, the spiritual community that I convene, Valley & Mountain, has stood in solidarity with these workers in their struggle for dignity in the workplace. We have listened to the truckers’ stories, held a focused study of the issues, attended a Port Commissioners meeting to demand justice from elected officials, and participated in a major rally in support of the workers’ simple requests for access to bathrooms, less toxic trucks, and basic workplace protections (to learn more about their plight, read their open letter in support of the port occupation). I participated in the protest in order to stand alongside them. Second, I participated because I have witnessed overwhelming evidence that the economic and political systems of my country stand against those people who the God I worship stands for. My conception of God, inadequate as it may be, is better described as the Love that generates creativity and community than as a super-man judging us from some heavenly skybox. Such a Love contrasts with everything that reserves power, dignity, wealth, or the status of full humanity for some while denying these things to others. My commitment to Love requires me to challenge the increasing consolidation of all these good things in the hands of a few, and to collaborate for the creation of something that Love would recognize as kin. By listening deeply, I mean the kind of listening that allows the experiences of others to alter your own worldview. It may mean allowing the stories of exploited people, like the port truckers, to challenge your assumptions about the American narrative of equal opportunity. It might mean allowing my story to challenge assumptions you may have about the reliability of police discipline or the impartiality of mainstream media impartiality (reports of the protest didn’t match what I saw or experienced). Whatever it means, it will require humility and proactive encounters with people you might usually avoid. By getting upset, I mean being appalled at the dehumanizing forces operating in our world—forces unveiled by deep listening. Nothing changes just because you become aware that port truckers have to defecate in plastic bags because they’re barred from using the employee bathrooms. Nothing changes just because you know that some cities have police cultures that encourage brutality, particularly against people of color. We must have the tenderness of heart to become upset when the rights of human beings are violated and oppressed. By generating love, I mean channeling that passion into creative and liberating action. There are so many excuses to avoid it. But as the great preacher and activist William Sloane Coffin once said, “Not taking sides is effectively to weigh in on the side of the stronger.” As finite creatures, we cannot fight every worthy battle. But refusing to participate in any struggle for a more loving world is a nihilistic rejection of even our very finite power. Right now I am praying for the courage to transform the molecules of my anger and the raw material of my frustration into the greatest, most indestructible, most transformative power on earth: unconditional love in action. John Helmiere adapted this article for YES! Magazine, a national, nonprofit media organization that fuses powerful ideas with practical actions. He is a commissioned minister in the United Methodist Church and serves as the convener and Minister of Listening at Valley & Mountain. He is active with BikeWorks, Poverty Action Network, Earth Ministry, Faith Task Force for Worker Justice, and other organizations.